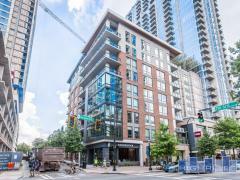 Juniper and 5th J5 Condos of Atlanta, GA | 775 Juniper St.
Juniper and 5th (or J5) is a modern condo community in Midtown. The building includes a wide range of amenities including private underground parking, EV charging, a pet spa with elevated tub, conditioned storage, mailroom with 24 hour package retrieval, fitness center, garden courtyard, pool and poolside clubroom, rooftop lounge, and more! The homes have contemporary modern interiors with soaring ceilings, open floor plans, large terraces, and top of the line appliances and finishes. There are many perks of living at J5. The central location is just blocks from restaurants like Takorea and Cypress Street Pint & Plate or you may enjoy taking in a show at The Fox Theater. The Fox Theater is a renowned venue that features Broadway shows, concerts, and comedians and is a short 5 minute walk from home! Have any comments or questions about Juniper and 5th? Ask your question and/or share your thoughts about this Building.